In this beer blog, we are going to get into another brew from New Glarus Brewing Company. The beer is called Coffee Stout. If you read my earlier beer blog, you know the history of this brewery. If you have not, please, read that earlier beer blog. Let us get into this beer. This coffee stout has a black color with a tan color head on the brew. The smell is chocolate with a little coffee notes. The taste of the full body beer has a chocolate with a little coffee notes. The aftertaste is a dry coco to the beer. It is kind of drinkable beer. Hearty and satisfying, out Coffee Stout is the ultimate full-bodied brew. Wisconsin water, roasted malts and American hops are the natural ingredients we use to brew this bier. Then cold pressed organic coffee from Just Coffee co-op is infused into the brew. Expect this bier to pour a deep creamy head over an ebony rich body. Notice the powerful malt bouquet balanced by a spectrum of extravagant flavor. 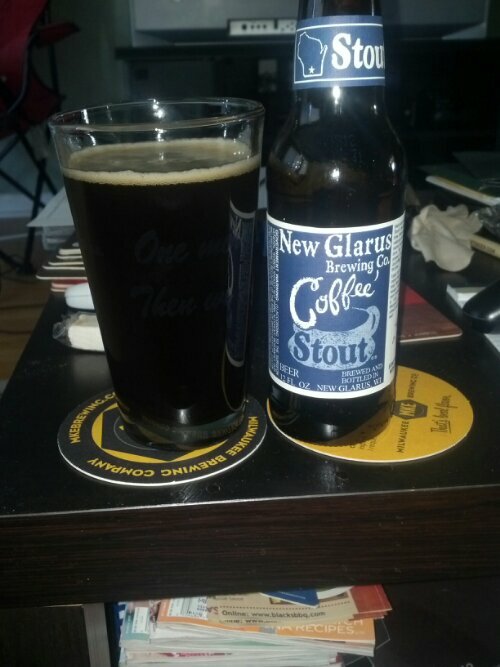 Served at room temperature this Wisconsin Coffee Stout is guaranteed to warm even the coldest heart.